Declare your love of chocolate with a sign! 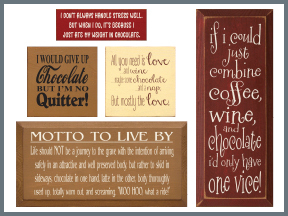 Whether you like chocolate with your coffee, chocolate with your wine, or chocolate with your chocolate, we have the perfect signs for chocolate lovers! With over 40 colors to choose from, your solid wood sign from Sawdust City will look great anywhere! Quick!...Hide that chocolate in my mouth! Stop trying to make everyone happy. You aren't chocolate.